Modern homes have high levels of energy efficiency, but older buildings weren’t constructed with the materials and products to which we have access now – nor with the concerns we have about heat loss in mind. But if your home’s draughty, your rooms are cold, and you’d like to benefit from lower fuel bills, there’s plenty you can do by insulating your home to make it a warmer place to live, whether you're renovating or just updating. Get in the know about draught-proofing and home insulation with our guide. Unless your home is very new, you will almost certainly lose some heat through air leakage around doors and windows, gaps in the flooring, or through the chimney. Windows can be improved with draught-proofing strips around the window frame. Select from self-adhesive strips and metal or plastic ones with brushes or wipers. The latter cost more but should last longer. These are also best for sliding sash windows. Non-opening windows should be draught-proofed with silicone sealant. Doors can be tackled with a keyhole cover, letterbox flap or brush, a brush or hinged flap draught excluder for the gap at the bottom, and the same strips as those used for windows at the sides. Find out how to maintain doors and windows in period homes. Chimneys can be fitted with specially designed draught excluders. You, or more often a professional, can fit a cap to the chimney pot, too. Discover how to maintain fireplaces and chimney pots in old homes. Floorboard and skirting board gaps can be filled with flexible fillers, decorator’s caulk or mastic products. Read our guide on insulating floors in old homes. Loft hatches can be fitted with strip insulation. Pipework that has gaps around it can be sorted with silicone fillers or expanding polyurethane foam if the gap’s larger. How much money will draught-proofing save you? Draught-proofing around windows and doors could save around £25 per year, according to the Energy Saving Trust (EST), while draught-proofing an open chimney you aren’t using could save around £15 per year. You might also be able to turn the thermostat down as your home should be comfortable at a lower temperature with draughts dealt with, so savings can be bigger. Draught-proofing is a simple DIY job, or you can call in professional help at a cost ranging from £85 to £275 for a whole house, according to the EST. Tip: Although preventing draughts is important, it is essential to leave ventilation ducts and airbricks clear – closing off all ventilation leads to condensation and damp problems. Lagging water tanks and pipes reduces heat loss, so you spend less money heating water up and it stays hotter for longer. A hot water cylinder jacket costs about £15, and fitting it is a fairly straightforward job. Topping up your hot water cylinder insulation from a 25mm to an 80mm jacket could save around £20 a year. If yours didn’t have any insulation at all before, fuel bill savings could be £80 per year. Pipe insulation consists of a foam tube that covers the exposed pipes between your hot water cylinder and boiler. Choose the correct size from a DIY store and then slip it around the pipes. Materials will cost around £20, and you’ll save around £3 to £7 a year on energy bills. Radiator reflector panels reflect the heat back into the room. They’re only necessary for radiators hung on external walls and most beneficial when that’s an uninsulated solid wall. A quarter of heat is lost through the roof in an uninsulated home, according to the EST. 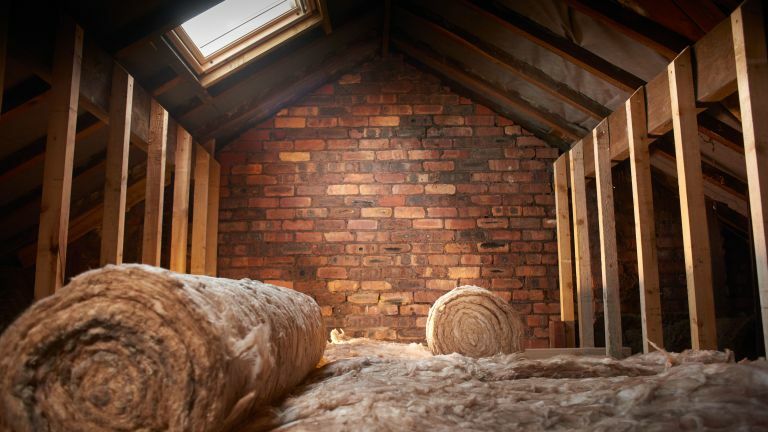 Loft insulation lasts for at least 40 years and should pay for itself many times over. Loft easy to access and has no damp problems? You can DIY. Calling in a professional’s also possible. Loft damp? Sort this out first. If the loft joists are regular, you can use rolls of mineral wool insulation. Lay the first layer between the joists, and the next at right angles to cover the joists, and to take the insulation up to the recommended thickness of 270mm. For old buildings, permeable insulation is effective. Find out more about loft and roof insulation for period homes. Most homes have insulation of just under half this. Topping it up from 120mm to 270mm could cost from around £230 for a mid-terraced house to around £290 for a detached, saving from around £10 to £20 a year on heating bills, depending on the property. If you plan to use the loft or attic for storage, you will want to lay boards over the joists. Unfortunately if you only insulate between the joists before doing this, the insulation won’t be thick enough. To get a sufficient layer of insulation, you can fit timber battens across the joists, or buy purpose-built plastic legs that fit on and support the new floor. Leave a ventilated air gap between the insulation and the boards to prevent condensation on the underside. And don’t squash the mineral wool with the new boards as this reduces its effectiveness as an insulator. If you want to use the loft for storage, rigid insulation boards are more suitable. Two layers of 50mm extruded polystyrene boards laid between the floor joists, plus 18mm flooring grade tongue-and-groove chipboard is equivalent to 270mm of mineral wool and would cost £450 to £550. EST research has found that 46 per cent of people still need to draught-proof their windows and doors. A good DIY draught-proofing job could cost up to £200 for materials and installation for your whole house, and save you around £25 a year. Room thermostats allow you to set and maintain the temperature at home. Heating can be programmed to turn on and off at certain times of the day to suit your needs. Thermostatic radiator valves (TRVs) let you control the temperature of each radiator individually. Costs can vary significantly due to the variety of heating systems types and sizes and controls available, but savings could amount to £75 to £120 a year. If your boiler is more than 10 years old it will be far less efficient than a newer model. Consider replacing it with a condensing boiler and you could reduce your fuel bills by £80 to £375 per year. For a loft conversion, it’s the roof rather than the floor that requires insulation. As the depth between the rafters is not usually sufficient to take 270mm of mineral wool, a more thermally efficient form of insulation is usually used. A typical solution would be foil-faced, rigid urethane insulation boards (try Kingspan or Celotex), fitted both between and over the rafters. Another option is to incorporate multilayer foil and bubble wrap insulation, which is more space-efficient, but not accepted by every local authority – call yours to check. Whichever material is used, it should be carefully taped together to make it as airtight as possible. If the roof is being stripped, there is the option to add roof insulation between and over the rafters, which leaves more useable space within the loft. An alternative for where there is no roofing felt is to spray urethane foam insulation on the underside of the roof tiles, which can seal the roof, fix loose tiles and insulate the space all in one application. Tip: An inaccessible loft can be insulated professionally using specially designed loose material that’s blown into it. A flat roof, meanwhile, should be insulated from above. Houses built from the 1990s onwards generally have wall insulation, but older houses may not. The type of insulation required depends on whether your home has solid or cavity walls. The former are made of (usually) an outer brick wall with an inner layer of brick or block with a gap in between. Solid walls have a single layer that’s usually brick or stone. Does your home have cavity or solid walls? House built after the 1920s? It’s likely to have cavity walls. Take a look at the width of the wall, too. It it’s more than 260mm thick it probably has a cavity, says the EST. Stone walls can be thicker, though, but are usually still solid. The pattern of the bricks can be a clue, too. If the faces of the bricks (the long rectangles) are all lined up next to each other, the walls are most likely to have a cavity. If you see the face of a brick then the head of a brick (the shorter, more square end) the wall is most likely solid. A registered installer can inspect walls to see if they already have cavity wall insulation, or your local authority’s building control department may have a record. Cavity wall insulation fills the gap between the outer and inner layers of the walls. The average cost for cavity wall insulation in a typical home is around £370 for a mid-terraced house to £720 for a detached. Fuel bill savings could be from £90 to £250 per year respectively, according to the EST. Find out more about cavity wall insulation. Solid walls can be insulated from inside or out. Internally, insulation boards are fitted to the wall or a stud wall is built and filled with insulating material. This is generally the cheapest method – the EST estimates a range from £4,000 to £13,000 – but it will make rooms smaller and means skirting boards, door frames and fittings have to be moved. If solid walls are insulated from outside, insulating material is attached to the outside of the wall, then covered with a protective/decorative layer, such as render. Other options include brick slips, timber weatherboarding, hung tiles or cladding panels. These can potentially improve the look of the house as well as making it more energy efficient. External wall insulation is in general far more costly (EST figures for a typical installation are from £8,000 to £22,000) but it doesn’t reduce the floor area of individual rooms. However, as external wall insulation does increase the thickness of the walls, the roof eaves and verges often have to be extended to cover this; the reveals of window and door openings will also have to be clad, and windowsills may need to be replaced or deepened. Gutters, downpipes and external soil pipes will need to be removed and refitted. External insulation will generally require planning permission and, if you live in a conservation area or other designated area, this will be the case. It’s unlikely to be acceptable on a listed building. Get in touch with your local planners for advice. Solid wall insulation can reduce energy bills by between £155 for a mid terrace to £415 for a detached per year. The EST advises that insulating the floors of upstairs rooms may be unnecessary if they are above heated spaces. Do consider insulating any floors over unheated spaces such as garages, though, as a lot of heat is probably being lost. Older houses are more likely to have cold and draughty suspended timber ground floors, so insulating the floors of period homes could save you money. For insulating and draught proofing a floor, the EST estimates savings of between £25 and £65 a year, depending on the type of house. Suspended timber floors can be insulated by placing rigid insulation board between the joists, supported by nails or timber battens, or by placing mineral wool bats supported by plastic meshing, to ensure the joists are still ventilated. A breathable membrane over the top of the joists can prevent draughts while ensuring the space is ventilated. If there is a cellar or void beneath the property, it may be possible to insulate a timber floor from underneath, but in most cases it will be necessary to lift the floorboards and to fit insulation from above. Many newer homes will have a ground floor made of solid concrete, which can be insulated. However, this can be a costly process as it will raise the floor level, necessitating adjustments including flooring, skirting boards and door levels. It may be worthwhile if extensive renovations are already planned, using a rigid foam insulation layer laid on the concrete floor with a damp-proof membrane. In older houses, flagstones may be laid directly on to compacted earth. In this situation, where major renovation work is being undertaken, limecrete (NHL) based insulated solid-floor systems can be used, which allow the floor to breathe but provide thermal insulation and damp-proofing. A solid concrete floor with a damp-proof course is not usually suitable for old solid-walled buildings, as it can lead to rising damp by forcing ground moisture to the base of the walls. Home insulation has to comply with the relevant building regulations, even when it is fitted retrospectively. However, if such an upgrade is not technically or functionally feasible, it can be upgraded to the best standard. For more guidance on the regulations, visit the government’s planning portal.